The power of the slip dress lies in it’s understated sexiness. It takes you from daytime to nightfall. Those 90’s babes knew what they were doing when they first shimmied into the slip dress. Historically a slip was worn underneath a dress to help it fall smoothly. Then the underwear-as-outerwear trend caught on and slip dresses went to the forefront of fashion. Kate Moss, of course, led the way thanks to her friendship with John Galliano (who heralded the slip to the runway). But the other 90’s girls also knew what to do with them. Naomi Campbell, Winona Ryder, Sofia Coppola, and Carolyn Bessette-Kennedy all pulled out their slinkiest slip dresses and wowed the world with this new style. We remember the 90’s as Spice Girls (with the exception of Posh Spice’s “little black dresses”) and grunge. In the underbelly of this decade there was a subtle fashion minimalism where the slip dress flourished. The power of the slip dress is just as effective today as it was 20 years ago. 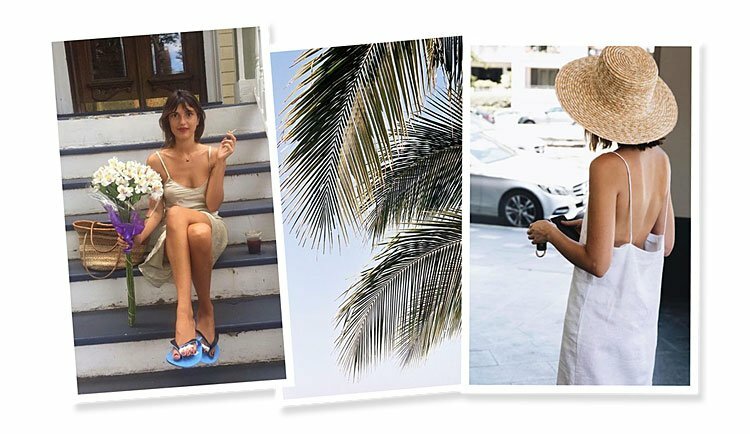 Camille Rowe, Lily Aldridge, and countless Instagram it-girls all rely on the slip dress. Understated sexiness will always be in fashion. Is there too much leg? Is there too much cleavage? Does the dress move fluidly? I.e. Can you move around without feeling constricted? Is it see-through? Does it matter to you if it is? How easy is it to get in and out? If you can’t just pop the slip dress over your head, chances are it’s the wrong slip. The perfect slip dress is cut on the bias, so it hugs your figure, but not TOO much. Ideally your slip dress should come to just before your fingers. Not too short, not too long. Just enough to show some leg, but just enough so you can still bend over without flashing the world. It doesn’t maximize your cleavage. A slip dress is cut so that your chest is not on centre stage. You can’t wear a proper Victoria’s Secret style maximum push-up bra with a slip (heaven forbid bra straps — a huge point of the slip is that it looks like you either rolled out of bed or are about to roll into bed). So cleavage is downplayed. You can generally find a good silk slip for less than $200. Silk knows what to do for your body more than polyester or rayon. An undeniably sensual fabric, it also feels sexier and more charming when it’s on you. It puts you into the mood for whatever persona you want to take in a slip dress. Want to be more rock and roll? Grab your beat-up leather jacket or slip on your holy (literally hole ridden) old t-shirt underneath. Want to be more coquet-ish? A pair of strappy heels will help with that. Want a more well-traveled vibe? Nothing works better than some well placed jewelry. Above all, always get 100% silk. Does anyone actually love polyester?